Being a patient in a hospital is inherently scary. You don’t feel good. The things people do to you can hurt. It’s boring. You don’t know what’s going to happen. You have no control. And that’s if you’re a grown-up. If you’re a child, it’s even more frightening. So if a clown comes up to you — not someone in stylized make-up, not some grimacing cartoon, but a life-sized person who happens to be wearing a big red nose and maybe some funny clothes, someone who looks straight at you and is silly and laughs and stops if you say stop and is warm and nice and seems to know what you’re thinking, or at least some of what you’re thinking — that can help. Dream Doctors is an Israeli nonprofit that often works with the country’s ministries of foreign affairs and health. 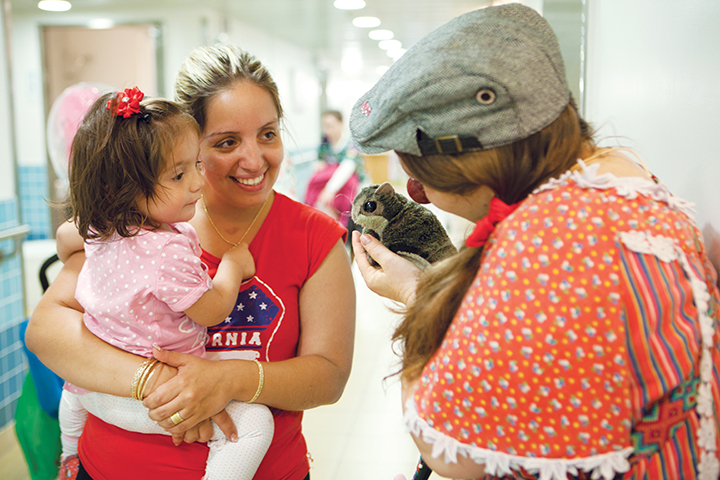 It operates in 29 Israeli hospitals — that’s almost all of the country’s hospitals — and offers training, workshops, and programs around the world. Nimrod Eisenberg works in hospitals in Israel, as here, and around the world. Nimrod Eisenberg is one of the Dream Doctor’s original clowns; he was in New York recently, along with the group’s resource development director, Megan McLean, to talk about the program. So, Nimrod talked about how he became a medical clown. He was born in Jerusalem. His mother’s family has been in Israel for nine generations; they went from Europe to Sfad in the 18th century. His father’s family went to Palestine in the 1920s, between the world wars. “So I am a Jerusalem character,” Nimrod said. Dream Doctor Zoya Hayat clowns with a patient and her mother in Israel. When he was in high school, he began to perform as a juggler and circus artist. “Juggling is like a contagious disease,” he said. Once you’re exposed to it, you catch it, and then you give it to other people as well. “Juggling is amazing, both as a personal sport and a team sport. You begin by tossing it back and forth.” You learn from one other. Once he was out, “I felt like I already had a skill, so I started performing. I would do different events and parties. I learned stilt-walking then.” He really loves to walk on stilts, although he doesn’t do it much anymore. “I did it on Purim,” he said. Nimrod wasn’t taught circus arts formally, but “we learned from each other. Jugglers and circus artists are unlike magicians. They tend to share things.” It’s a very public art form, he said. In 2015, after the earthquake in Nepal, Dream Doctors went there to help. Here, Nimrod Eisenberg is in a NICU — the clowning is for the baby’s parents. He spent a few years working as a circus performer in Israel. “There are a few circus troupes in Israel,” he said. Over the last 15 years or so, the culture has been developing. It’s tending more toward the European style — clean-faced rather than made up, costumes with less fussy lines, no animals — than the classical style we know from Ringling Brothers. Next, he went to Europe for four years; “I went to France and Italy, studying physical theater, pantomime, and clowning.” Traditional clowning developed there, he said, including the idea of the red nose, the bright focus that lights up rather than hiding the rest of the face, freeing the rest of the face to express outsize emotion. “The nose doesn’t cover me,” he said. “It exposes me.” He demonstrated, putting on a red nose. Instantly, the rest of his face seemed more, well, clown-like, his mouth bigger, his eyes brighter. It’s hard to tell if he exaggerates his facial movements more with the nose on, or if the nose makes the same movements seem more exaggerated, but either way, it works. Although clowning often is thought of as wordless, it is not. And anyway, Nimrod also is an actor. “I love language,” he said. “I love words.” He knows four languages fluently — Hebrew, English, French, and Italian — and he’s picked up some Arabic and Russian. Part of that comes from his work in hospitals. “Israel is an ensemble of cultures,” he said, and that ensemble plays together in hospitals. Left, Aviad Sharkstein and above, Shoshi Ofir are at work in Israel. That was in 2003. (The project started in 2002, but it was smaller and less official then.) “There were 12 of us, street artists interested in taking our art into hospitals,” Nimrod said. Why did he want to do it? Why does he still do it? 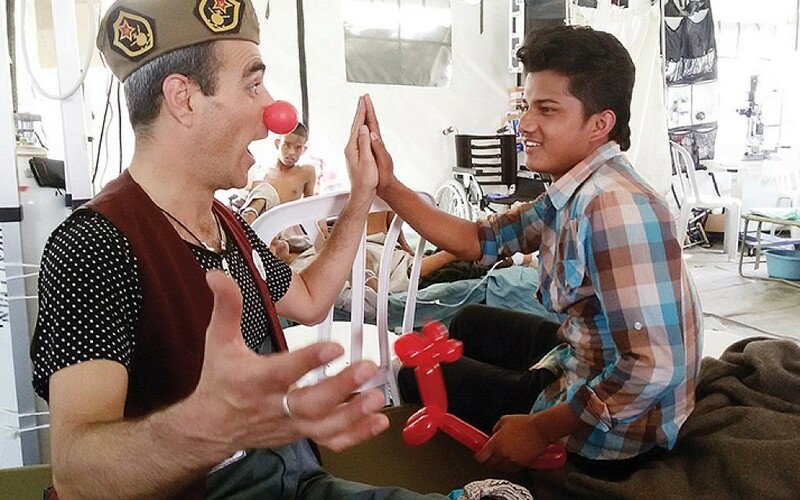 “There is a natural connection between the joy, the happiness that clowns produce, and the people who really need it,” he said. “The people who really need it can appreciate it more. People under stress, people living through problematic times, somehow are more able to accept the playfulness. “If living in Israel teaches you anything, it teaches you flexibility. You have to talk to everyone, to listen, and to work together. All those are assets for medical clowning. Israel is a very open culture. Anyone can say anything to your face. There is not much politeness. That is a benefit. Clowns are able to open emotional doors. “I feel very much that Jewish humor always has been about laughing at sad stories. A good Jewish joke is a sad story with a happy ending. It is a hug for your heart. 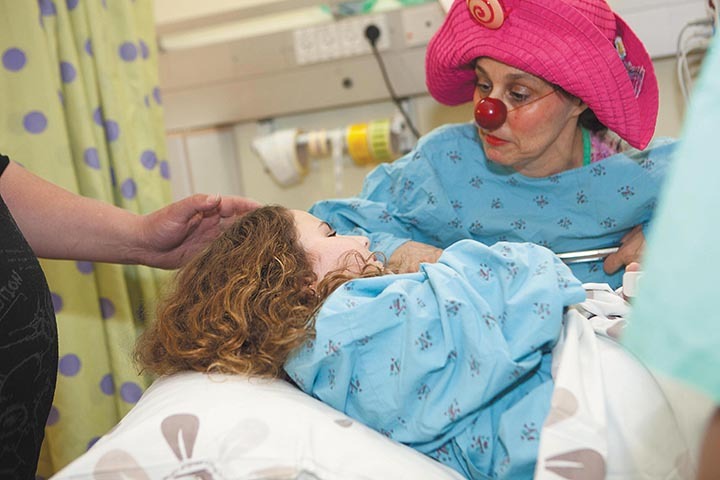 Medical clowning is a very Jewish thing to do — to go to a sad place and try to bring light and compassion and friendliness. “Israel itself, as we know, is a tough place of many sad stories, but actually if you walk around the street of any major Israeli city, you see that it is normal place. Dream Doctors — here it’s Tal Stein — work with patients of all ages. For example, Nimrod was in Jerusalem years ago, “my first day on the job, and I am in the room with a gay couple, father and father and kid, and a religious family. The kids were very young, around 2 or 3, and it’s a very easy age for a clown to work with. I start to play with them. I understood the unspoken difference between the two cultures, but I just played with the kids, and I could see that the families could start to see each other, finally see each other as families. Public hospitals are not allowed to discriminate against anyone, Nimrod said, so illness often makes surprising roommates. “The clown has to be highly sensitive to everyone around him. The first thing that will save you from cultural misunderstanding is to avoid words and jokes. You don’t come as a joke teller. The work of the clown is not to tell jokes but to make people laugh and bring them joy. Dream Doctor Zoya Hayat and a young patient play. “It is not necessarily silent clowning, but we know that the deep power of the clown is to see that all human beings are the same. The beautiful thing about the clown is that you can say the truth. You can speak the unspoken truth and bring it to the light. “The clown is an outsider,” he said. There are cultural differences, to be sure. 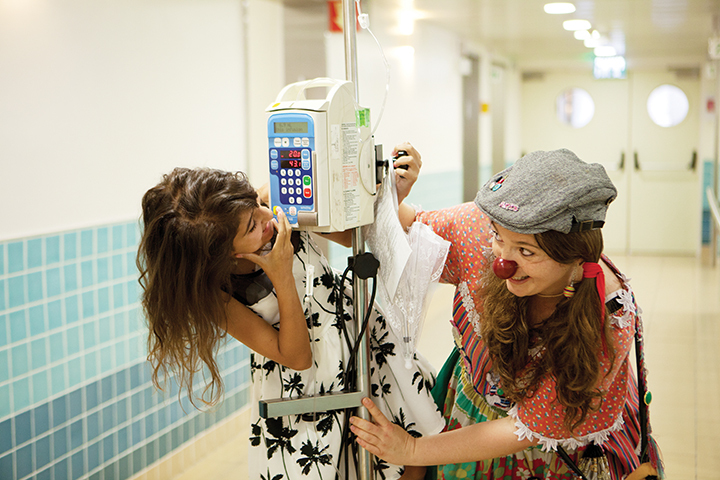 Israeli children are less sensitive about hierarchies, for example, so clowns can gently mock doctors and they will laugh. With Bedouin children, whose culture stresses hierarchy more, it’s not so effective. But in general, “the hierarchy in the hospital is clear.” But if doctors are the kings and nurses the queens, and patients far down in the deck of cards, then the clowns “are the jokers,” Nimrod said. “We can play anybody’s role.” That freedom that comes from being outside the hierarchy helps them reach directly to patients’ hearts. Now, many years into his career as a Dream Doctor, Nimrod clowns, and he also teaches clowns. 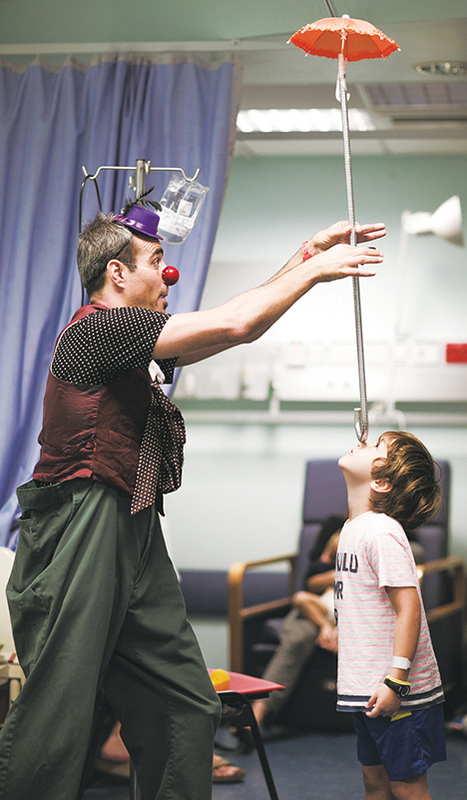 Medical clowning isn’t for everyone, he said. “I recruit new clowns. We know after 20 minutes if someone can do it. It’s about how he reacts to the situations of pain, of agony, of sadness. 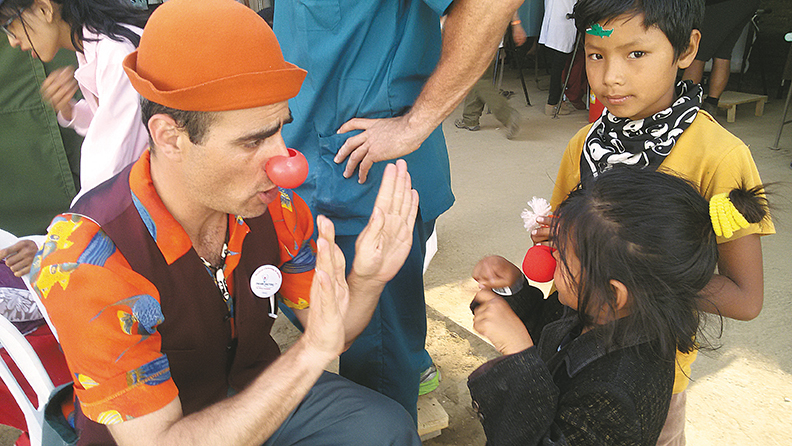 Dream Doctors get around — Nimrod Eisenberg is in Nepal. 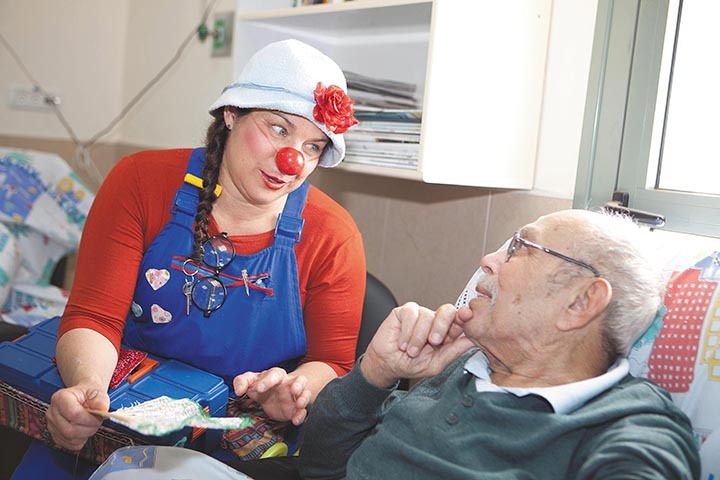 There are medical clowns across the world, some of them in the loosely affiliated group to which Dream Doctors belong, but there is something uniquely Jewish and Israeli about it, Nimrod said. Dream Doctors work all over, “from pediatrics through geriatrics,” Nimrod said. “We even work in IVF clinics,” because some scientists think that a woman’s state of mind affects her hormones, and her hormones affect whether or not the treatment will take and eventually turn into a fetus. 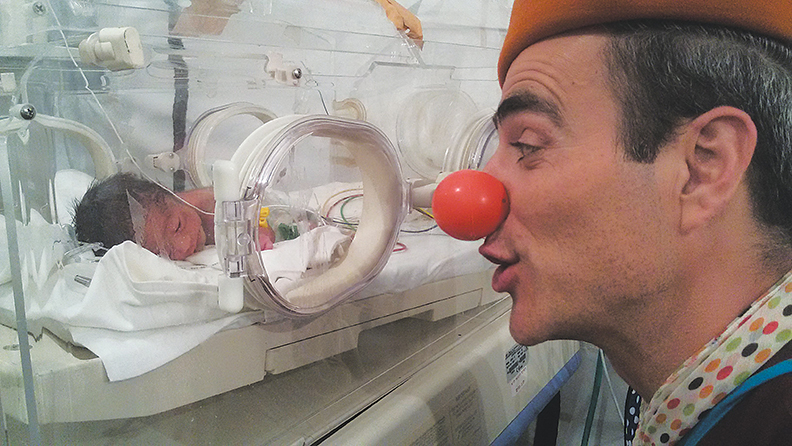 A medical clown can even work in a delivery room, although “only if a woman already has gone through the process with a clown, and actively demands one” while she is in labor. 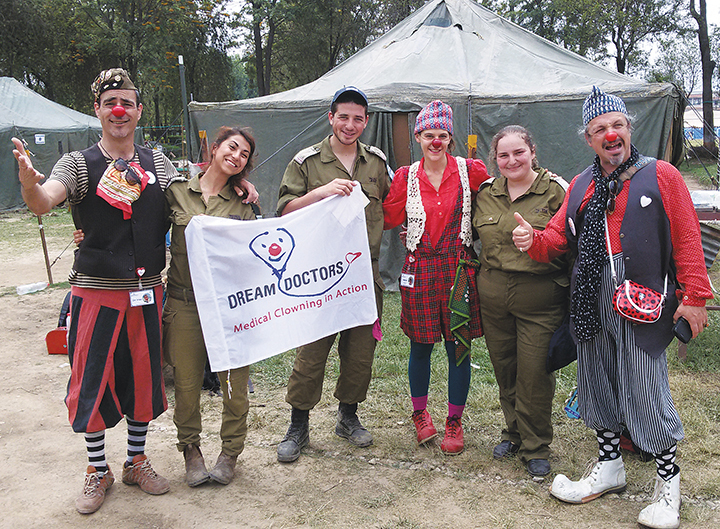 Dream Doctors join Israeli soldiers in an IDF field hospital in Nepal in 2015. Nimrod has gone around the world as a clown. Dream Doctors work in collaboration with the Israeli Ministry of Foreign Affairs, and they often are deployed to help in crises. Nimrod was in Haiti after the earthquake there; other Dream Doctors flew to Houston after Hurricane Harvey. Even when parents don’t tell young children what happened, they can pick up the feeling of something being wrong, Nimrod said, and that feeling was powerful in Pittsburgh. That community is very “strong, and it was exciting to see how diverse it is,” he added. As an Israeli, Nimrod was an active reservist for 15 years after he finished his IDF service. He’s also gone with IDF teams to work in disaster areas. Now, though, the army acknowledges him not only as a veteran, but, according to the letter that he shows with great pride, as a medical clown. Last month, he said, he was in Romania, in an international European Union drill, “in a field hospital, with Italians, Norwegians, Germans, Austrians. I was the only clown.” He’s done similar drills in other places other years. “Medical clowns are a bridge,” he said. A bridge between cultures, between demographics, between pain and comfort, between sorrow and the hope of peace. Learn more about Dream Doctors here.